NEW BRITAIN – AAA stated in a press release on Monday that the price of gas in Connecticut is currently at its lowest point since before Memorial Day. The average gas price across the state on Monday was $3.05 per gallon. However, AAA said that the price is among the most expensive in the country. Connecticut had its highest gas prices so far this year from Memorial Day weekend through June 1, when the average gas price was $3.15 per gallon. May 15 was the last time that the average price of gas dropped under $3.05 per gallon in the state. AAA’s statement said the downward trend is expected to continue with summer coming to an end. “Demand is dropping off and, in another month or so, retailers will start switching over to the less expensive winter blend of gasoline,” Amy Parmenter, spokesperson for AAA in Greater Hartford, said. New Britain resident Rafael Rodriguez said he has not noticed much of a change in the price of gas. However, he said that regardless of the price, people still have to drive and will continue to use the pump. Victor Szuszakiecz, of New Britain, said he pumps his gas outside of the city because he finds that other towns have lower prices. “I think is more expensive than other places I go to,” Szuszakiecz said. But some gas stations in the city still have below average prices. 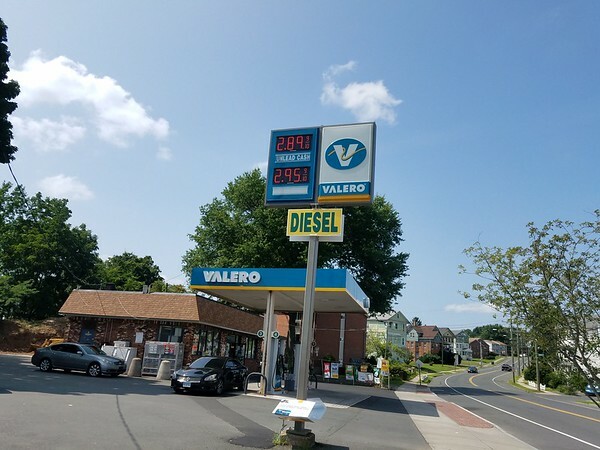 In New Britain’s Farmington Avenue Gulf and Valero gas stations, the gas price was $2.89 per gallon on Tuesday. The price at the CITGO on Allen St. was $2.85 a gallon on the same day. Vanessa Camacho, of New Britain, said it’s a relief that gas prices are going down now that Labor Day is approaching. “You save money, and you are able to go places, when it goes too high, you can’t really go anywhere,” Camacho said. AAA said that gas prices are slowly declining not only in Connecticut but nationwide. The gas in the state, however, is the ninth most expensive in the country. The most expensive gas markets in the country are Hawaii, California, Washington, Alaska, Oregon, Idaho, Nevada, Utah, Connecticut and Pennsylvania. Posted in New Britain Herald, General News, State on Friday, 24 August 2018 20:32. Updated: Friday, 24 August 2018 20:35.